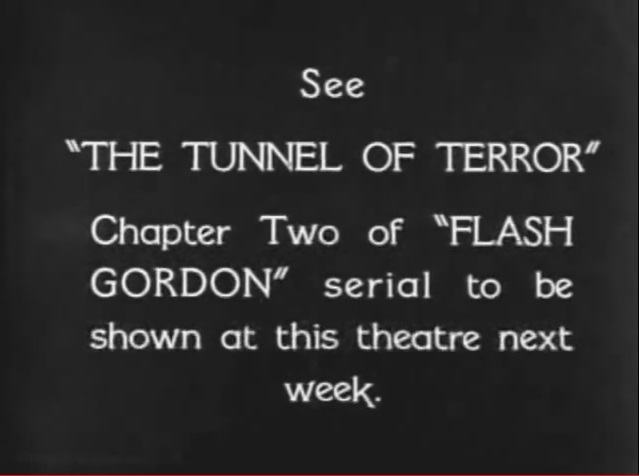 Time for the first chapter of the Flash Gordon rewatch. If you haven’t read the background for this series of posts, you can get up to speed with here. Otherwise, grab your popcorn and let’s settle down and watch The Planet of Peril. We start the show with Earth already under threat from a mysterious (radioactive) planet that will soon hit Earth and smash it to atoms. Not good. After a quick trip around the world where we see how people are reacting to their imminent demise, we join polo player Flash Gordon and the lovely Dale Arden on a plane caught in a meteor storm. Things are already looking bad, but thankfully the airline has thought ahead and provided parachutes. Unfortunately, safety standards being what they were in 1936, there aren’t enough parachutes to go round. Always the gentleman, Flash grabs Dale and jumps out of the aircraft. Landing in a strange looking country, Flash and Dale encounter Doctor Alexis Zarkov – the prototypical mad scientist who believes he holds the key to saving Earth. After a brief debate, the three of them board Zarkov’s rocket ship and head off to save the planet. Thanks to Zarkov’s rocket and its counter magnets, the three earthlings make it through “The Death Zone” and arrive safe and sound on the planet destined to collide with Earth. After some inconvenient tripping and a close encounter with some of the indigenous giant lizard creatures (I’m pretty sure I saw some sort of fake stunt lizard during the fight scene) they are captured by the Knights Who Say Ni and brought before The Emperor Ming. Ming immediately sees the potential in Doctor Zarkov and sends him to work in the laboratory (“Give him everything that he requires, except his freedom”). Ming then starts getting ideas about Dale, prompting Flash to step in to save her. 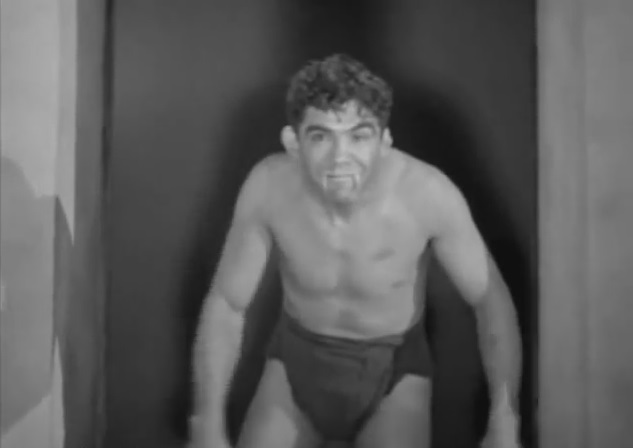 After some manly tussles with Ming’s astonishingly ineffective guards, Flash is captured and thrown into “The Arena” where he is forced to fight Neanderthal vampire men. Things look bad for Flash and his shirt, but thankfully, Ming’s daughter, Princess Aura steps in and saves him. Until, that is, Ming orders that they both be dropped into the pit beneath the arena. The chapter ends with Flash and Aura plummeting to their doom while a helpless Dale Arden watches on. If you’ve never seen one of these old serials, this first episode is an excellent introduction. Lots of action, lots of peril, some pretty random plot twists, and lots of cheesy dialog – “The Earth is doomed to destruction!”, “They’re using rays!” But that’s part of the charm of these old shows. I love the way ideas appear out of the blue either to add a bit of extra peril – The Death Zone! – or to explain how they were going to survive the latest peril – counter-magnets! Got a cool idea? Throw it in the mix, no need to foreshadow anything here. And that rocket ship design? Fantastic! I’m not entirely sure what happened with the parachutes and Flash throwing Dale out of the aircraft – that seemed a bit dodgy to me, but kudos to Dale for wanting to be part of the rescue mission, and I was happy to see some equal opportunity tripping – even the Doc couldn’t stay on his feet. Ming was just as evil as I remembered – how could he throw his own daughter into the ? He’s merciless I tell you, merciless. That said, I’m not sure I trust Zarkov either – threatening our heroes at gunpoint, “forgetting” to turn on the oxygen in the rocket ship, suggesting to Ming that he conquer the Earth instead of destroying it. 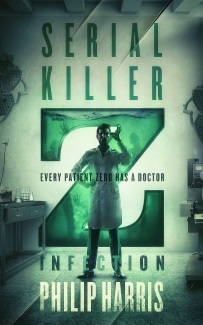 Subtle manipulation or a sign of darker things to come from Doctor Z. Time will tell. Meaningful glances galore as the “blond giant” and Dale are introduced to Ming and his daughter. You can clearly see the love triangle (love square?) forming. It’s going to be hard not to pick Ming for every chapter, but I’m going to go with the guards that capture Flash, Dale and Zarkov Almost completely ineffective and great costume design. Runner up prize to the guard that fails spectacularly to stop Ming’s daughter getting into the arena to save Flash, despite that being his one job. So, a cracking start – monsters, spaceships, fighting and a whole planet full of peril. Join me next week for Chapter 2 – The Tunnel of Terror. This is an excellent first episode to get one interested in the serial. While I have seen a few better first serial episodes, not too many beat this one. Right away we see simply masterful characterizations. The love triangles also add much to the storyline. My favorite scene is when Dale struggles futilely to break free from the two Mongo women holding her captive. The cliffhanger ending is not a bad one, but it is one of the weakest ones in this serial, especially since it seems like a letdown coming right after Flash defeats three cave-like men in battle. Right from the start, we see how much Princess Aura wants Flash. She saves him time after time in this serial. One cannot help but admire her persistence. 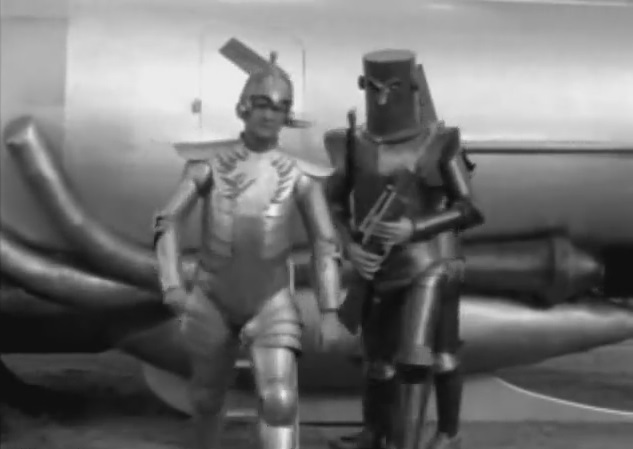 For those of you who have not seen this entire serial, let me tell you that it was the most popular cliffhanger serial of the 1930’s and 1940’s and in many ways, this serial paved the way for Star Wars, Star Trek, Lost in Space, etc. The rocket ships look superb, even if quite small compared to the Star Trek starships. The monsters are quite good, for the 1930’s special effects anyway. I keep hoping that this will eventually come out on Blu-Ray.